It's a slow day for the MCRT at NCIS Headquarters, with no case until, much to their surprise, one all but falls into their laps. An air conditioning repairman working on the roof of NCIS is suddenly killed by an explosion. It doesn't take long for their suspicions to be aroused: the repairman is an imposter working for a fake company, and he was killed by a defective bomb in his own toolbox. The building is evacuated while it is being searched for any other devices. But then somehow a lockdown is triggered, and the team is separated throughout the building. Abby and DiNozzo Sr. (who had stopped by for a visit) are caught in the morgue by the fake A/C repairman's brother, who takes Senior as a hostage and shuts Abby in a morgue drawer. Another infiltrator captures Torres, and Torres and Senior are taken down to the evidence garage. The brother proceeds to locate and destroy evidence from a case relating to a drug kingpin his brother worked for. Gibbs takes out the second infiltrator, but is taken hostage by the death man's brother as Torres and Senior escape the garage. Vance, McGee, and Sloane discover an MTAC technician was bribed to help the bad guys and take her down and restart the system. Going to the roof, Gibbs engages the brother, breaking the skylight and giving Vance a clear shot to kill the last man. Bishop: --on the roof of NCIS headquarters. Permalink: --on the roof of NCIS headquarters. 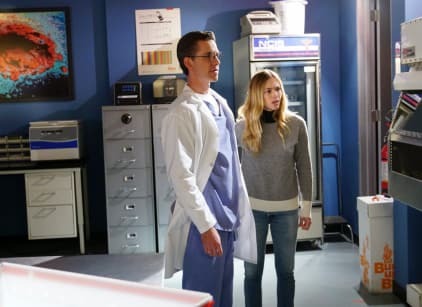 Jimmy: I mean, I guess I can see how some lawyer could use the confusion of an evacuation to call into question the chain of evidence, but, well, Autopsy *and* Abby’s lab have secure storage. These new rules clearly are written by some out-of-touch bean counter! Bishop: I helped write the protocol when I was at NSA. Jimmy: You used the words “evacuation” and “evidence” twice in the same sentence. Permalink: You used the words “evacuation” and “evidence” twice in the same sentence.